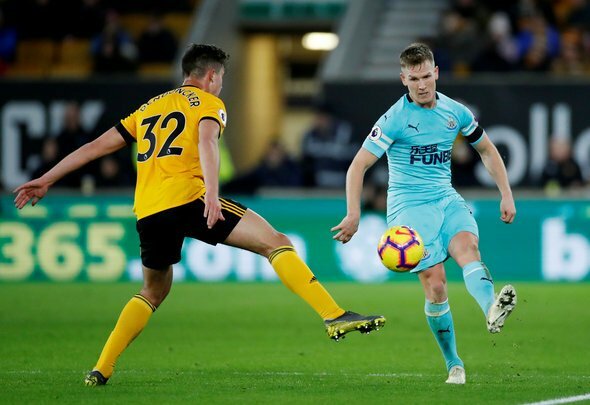 Newcastle United were forced to settle for a point against Wolves on Monday night as they conceded an injury time goal at Molineux. Isaac Hayden was the unlikely man who opened the scoring for Newcastle, the defensive midfielder fed by Fabian Schar from the edge of the box before firing past Rui Patricio between the sticks. His effort came after a first half lacking in opportunities for both sides, Martin Dubravka the busier of the two shot stoppers but remaining resolute to keep the home side at bay until the dying minutes when Willy Boly snatched a last gasp equaliser. So what have the Newcastle faithful garnered from this clash? It might have been Martin Dubravka who was at fault for defeat to Tottenham last weekend but he made up for his error with one of the most confident performances between the sticks the Premier League has seen this season. His gloves were like superglue, plucking balls out the air while keeping a hold of efforts which he would have been expected to parry away. He was tested throughout by Wolves but his reflexes were brilliant and without him you can be certain the Magpies would have lost by a lot. He might have been sat on the bench but it was clear Newcastle were crying out for Miguel Almiron for large parts of Monday night’s clash. There was a great big gulf between the midfield and attack and it is exactly there where the Paraguayan will be expected to sit when he does eventually start. His creativity will bring the best out of Salomon Rondon and give Newcastle an outlet to avoid knocking the ball long in hope of the striker winning it against Wolves’ defenders. There were a number of positive performances from those in the light blue of Newcastle’s third kit but DeAndre Yedlin cannot count himself among those. Time and again he was caught out by Diogo Jota on Newcastle’s right hand side and his impact down the other end of the pitch was also lacking, his pace offering nothing to try and build attacks for the visitors at Molineux. Really though he is in the side to defend and he failed to do the basics in an atrocious performance – games like this highlight just how much of a huge liability he is in Rafa Benitez’s back line.